L* - 0.276 „ "" y mL .+023Smel? Fig. 11-42. Beam Deflections, fnat>and Natural Frequencies, S. We can estimate the natural frequencies and deflections of beams for both axial and lateral or bending loads. In cases E and F, the values of m and mg are different from previous cases. 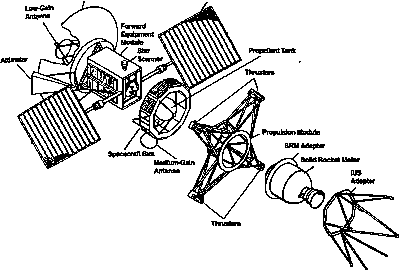 Some of the Magellan structures, such as the IUS and adapters on the propulsion module, lent themselves to the use of truss or strut members. The truss member design loads derive from preliminary load factors, the mass distribution, and the vehicle geometry. All 12 truss members are graphite-epoxy tubes with machined titanium end fittings. Four members are 10.2 cm in diameter. They were sized as beam-columns to withstand axial loading and bending while partially supporting solar panels during launch. 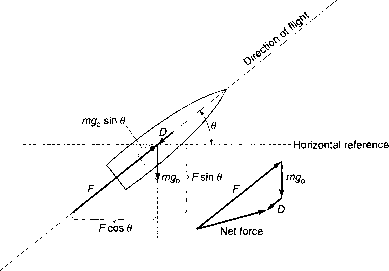 The ultimate, equivalent axial load is 102,300 N. The other eight members are 8.9 cm in diameter and sized for 93,410 N.
The adapter cone for the Solid Rocket Motor is a honeycomb structure that transfers the motor's thrust loads from 24 equally spaced bolts at the forward end to four large bolts that attach to the truss for the IUS at the aft end. The forward equipment module consists of a tubular framework covered with thin shear panels. The frames are welded 2219 aluminum alloy 5.08-cm2 tubing with wall thicknesses varying from 1.27 to 3.81 mm. Numerous equipment boxes are attached to the tubes using threaded fasteners for easy removal. The shear panels enclose the framework except where an equipment box forms an effective load path. The tube-member sizes result from beam-column analysis, including transient and acoustic loads. The following example parallels the process for sizing the spacecraft structure and booster adapter in Table 11-56. Structural size and mass are driven by either strength or stiffness requirements. We can begin the process by sizing the structure to meet load requirements and check the resulting natural frequency, or we can begin with a frequency requirement, size the structure, and check strength. Equations are provided to do either. Most short, heavy spacecraft are strength driven and long, lighter spacecraft or assemblies are stiffness driven. Any design with very thin skin or stringer sections can be sensitive to stability failures. TABLE 11-56. Process for Estimating Size and Mass of the Spacecraft Structure.